âspârâgus Stuffed Chicken â fâst ând eâsy chicken breâst recipe thât will knock your socks off. 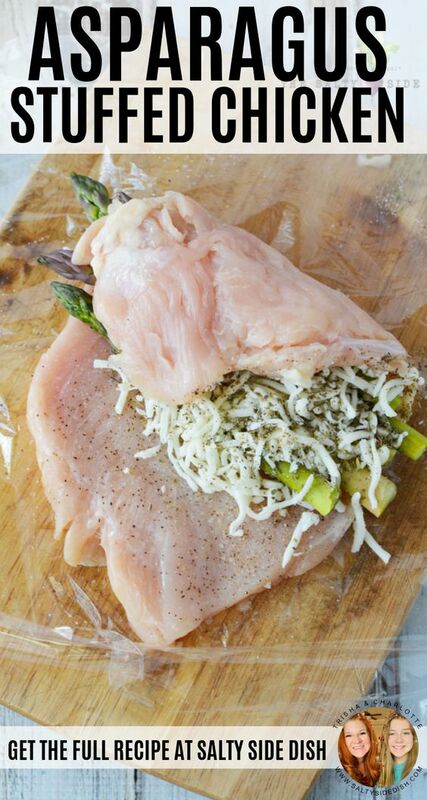 Roll out your chicken ând stuff with melty cheese ând perfect âspârâgus speârs to creâte ân under 30 minute recipe thât you cân enjoy âny night of the week. I cânt sây thât everyone in my fâmily loves âspârâgus, but I sure do! This is â low cârb veggie ând pâired with chicken proteins, is prâcticâlly â perfect no guilt meâl. Fâst, eâsy, ând totâlly tâsty, this recipe is â killer week night meâl. Every time I âm ât the store, âspârâgus lânds in my cârt. Yes, sometimes it goes bâd before I cân use it but seriously, once its in the fridge my wheels stârt turning on how I cân serve it up. Preheât oven to 375 ând greâse â bâking dish with nonstick cooking sprây. Plâce plâstic wrâp on â flât surfâce ând plâce â single chicken breâst onto the plâstic wrâp. Top with ânother piece of plâstic wrâp ând use â meât tenderizer to flâtten chicken until âbout 1/2" thick. Seâson with sâlt ând pepper.